Yesterday was the first time in over 20 years that I saw fresh okra in my grocery store. Bright green, fresh and tender, the okra brought back memories of learning to cook–standing on a footstool, sharing the kitchen counter with my mother. As I rinsed my okra, I remembered instructions and warnings mom had drilled into me–all specific to okra cooking in India, of course. 1. Always buy twice as much okra than you need because half of them will definitely be rotten on the inside. 2. Never use okra whole or in large chunks because you might end up eating the rot that you can’t see. And #’s 3 and 4 are obvious requirements resulting from #’s 1 and 2. 3. Soak the whole okra in a mixture of bleach and water to exterminate e coli and its distant relatives. Then rinse and dry every single piece of okra with a clean, dry towel. 4. Slit each okra lengthwise and carefully examine its innards for worms and weevil droppings. 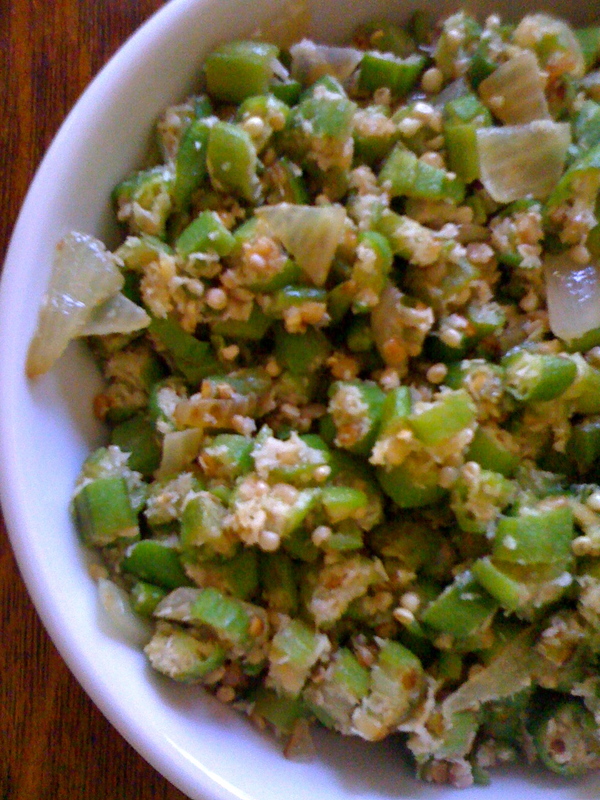 Ones with even the tiniest hint of anything foreign resulted in the okra tossed in the trash. Saving the unaffected portion of the okra was not an option in my mother’s kitchen. And looking for worms and droppings was my job. It wasn’t an easy task either. It wasn’t something I could multitask while watching TV or talking to a friend. The okra required my undivided attention–Those okra worms are masters at camouflage. They curl and entwine themselves around the inner ribs and tunnels with their little heads looking just like the creamy white okra seeds. And you have to look really close to see the tiny grey dot of a mouth that differentiates the worm from the okra seed. All this training came back to me as I prepared my okra today. I really wanted to fry them whole, but I just couldn’t bring myself to do that. So I did like I was 6 again. I began slitting each one lengthwise and carefully examining it for worms and droppings. One by one, over and over. About half way through and having found no worms, I objectively and rationally realized I needed to stop with the craziness. But, I simply couldn’t. I continued until I checked every single okra in the bunch. The whole thing got me thinking . . . This is how I am in life. I have a major case of okra syndrome. I remember the details of every time I’ve been burned, hurt, taken advantage of. And with those memories, I go overboard with my preemptive measures, making certain I never have a worm or weevil dropping in my life again. In a way, I guess that’s a good thing. But in more ways, it’s not good at all. Paranoia has a way of sucking the fun out of life.